Designing a home is a fun thing to do especially when you can create your dream house even if it is only in virtual world. For you who want to satisfy your inner interior designer self, then you should try play some home design game. As you know the fun when designing a house is not limited to adult only so we will give you a list of games that can be played by kids to adult so everyone can have fun with these games. For you who do not want to spend some money just to play these games, we will also give you some games that you can play for free. Now let us have fun by reading the list first. This first game is for little kids especially for those who love to play with Barbie. If you go to Barbie official website you will see a lot of games and one of them is this ‘My Dream House’ game. To play this home design game kids do not need to download the game as it is a browser game. Furthermore kids can play the game for free without the need to even register. Kids can choose which house to decorate, and then start to decorate each room in the house. There is a lot of furniture to be placed in the room; kids can even place their favorite Barbie character in the room while decorating. This game is intended for teens who love to play mini games from Bigfish. As you know Bigfish made their games for many platforms so you can choose to purchase one game which suits your platform choice. In this home design game play you will be given certain tasks which all involved decorating the house. Continue to do the task and gain more coins and higher level to finish the game. This is a casual game suitable to be enjoyed by the whole family members. The game already use 3D graphic but it is still friendly to be play with low spec hardware. If you want to get home design game that involved other things than only decorating your house then Castaway Paradise is the one for you. In this game you will get task to help the villagers in the island. Those villagers are animals who inhibited the island and you will get a house in the island that you can decorate with a lot of things. Not only decorating you will also able to go fishing, farming, and many others. There are a lot of items that you can collect in the game which make this game more interesting. You can also dress up your avatar with cute costume in this 3D cubic design style game. 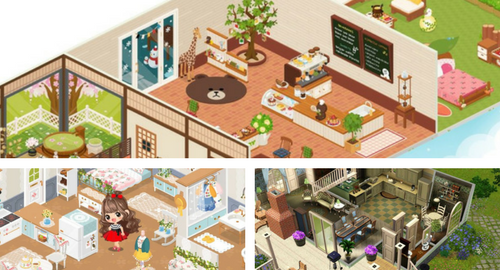 For you who want to have social home design game then this game from Naver is the one that you should get. This is a mobile application that you can play for free in Android and iOS device and available in many languages. In the game you will get an avatar that you can dress up anyway you want, you will also get a house where the avatar live. There are a lot of furniture sold in the shot or from the gatcha that you can use to decorate your room with different theme. Recently there is an addition of second and third floor option in the house so you can decorate more than one floor. Now for you who feel the need of more ‘adult’ home design game download, then you can try to play The Sims series. This series are very popular so you must have known a lot about the game play. Not only you can purchase and build houses, you can also decorate the interior inside. The graphic of this game is very high so you will see the interior decoration also very detailed. The life simulator aspect of this game is what makes it very famous series for adult gamer. Make sure that you play games that suitable for your age range so you can enjoy it. Especially for kids since there are other things in the game play that might not suitable for kids. Free games can be as good as the paid games so you do not need to be discouraged by playing it. However, usually those free games have some feature that you can use only when you purchase them. For example some furniture that you need to purchase with real money. Before you go and buy a game you should make sure that you have the right hardware to play since simulation home design game like this often need high spec equipment.